I reviewed a couple body products from Rachel's Plan Bee in early December, but I realized over the weekend that I'd yet to write about the company's lovely face oil, which I've also been using for the past few months. 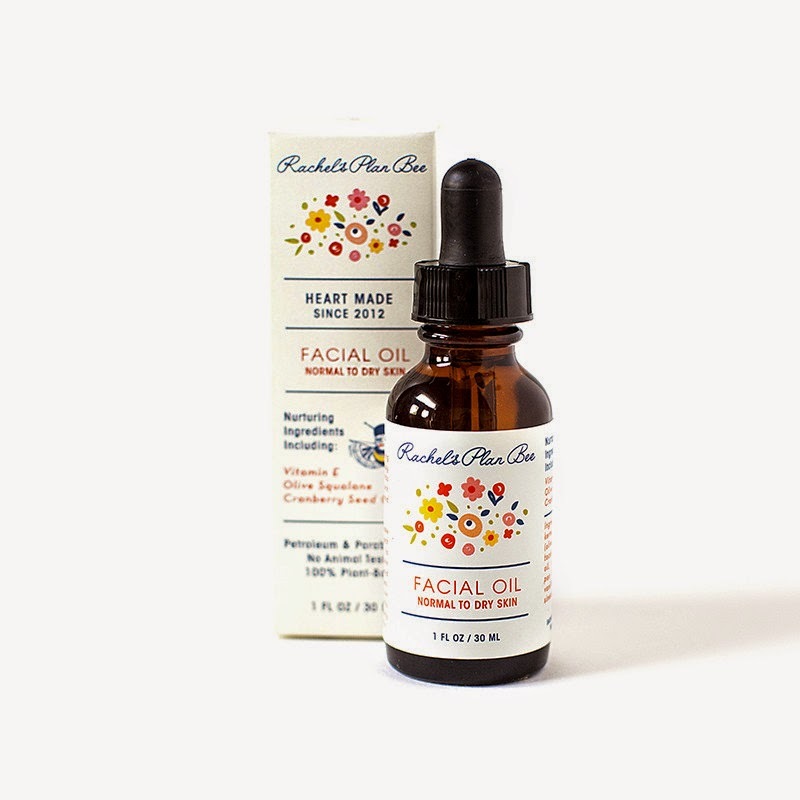 Rachel's Plan Bee describes the Facial Oil* as "a botanical blend of skin loving oils for your face + a happy scent," which I think describes it pretty perfectly. With apricot kernel, grape seed, safflower, olive squalane, and cranberry seed oils, plus a healthy dose of vitamin E, the oil sinks in beautifully, delivering a great boost of moisture and nutrients to the skin. The company doesn't make any intense anti-aging claims (refreshing, isn't it? ), but I think I'd be remiss if I didn't at least mention the high regenerative properties of olive squalane or the sheer volume of antioxidants that cranberry seed oil is packing. The oil is also beautifully scented with vanilla and orange essential oil and was in fact the inspiration for the company's Body Oil, which launched onto the green beauty scene with quite a bang this past fall. I think I made it clear in my review just how much I love the Body Oil, but there are still occasional days when I find the scent a little overpowering, so I was concerned I might have the same problem with the facial oil. I'm happy to say that I've not had any issues thus far. The face oil has the same scent, but - to my nose at least - it's a good bit less strong. I catch whiffs of the body oil on my skin throughout the day, but the scent of the face oil is only something I notice while I'm applying it, which is likely due to both the milder scent and the fact that one uses a lot less oil on the face versus the body. This is one of those face oils that I think would suit almost anyone. It smells good and has a great feel - lightweight, but still very moisturizing. For my basically normal skin, I use 3-4 drops, but you could definitely tailor the amount to suit your skin's needs. The simple ingredients list has everything you need and no fillers or extra ingredients. I also love that it's affordably priced at $20 - great for someone just starting out with face oils or the connoisseur looking to further expand their collection. P.S. If you feel like jumping on this - or anything else from Rachel's Plan Bee - the company is offering 2 free lip balms with any $20 purchase now through Valentines Day (no coupon code needed). This sounds lovely! I missed the chance to try this and their body oil and regret it. None the less, this brand still remains on my wishlist.